In what should surprise no one, The Interview features Korean that really doesn't make that much sense. Yes, yes, the movie is satire. And yes, yes, it's aimed at the English-speaking world, but with linguistic errors peppered throughout the flick, one has to wonder: Couldn't Sony Pictures hire a proper Korean language translator to, you know, check the film's lingo? 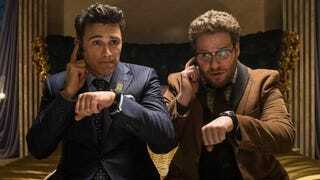 The Interview, pulled from theaters, incited a massive cyber attack against Sony Pictures. The film did hit select theaters and was released online. Hollywood, of course, is no stranger to butchering foreign languages in its films. But with The Interview, the mistakes are getting mainstream coverage in South Korea on sites like YTN and YTN Plus, with native speakers scratching their heads at the movie's gibberish Korean. Sounds like this is more sloppy than satire. For example, the side of this North Korean helicopter should read 주의 or "Warning," but it actually reads 주위 or "Surroundings" or "Circumstances." Doh. Here, the stop sign reads 받아막다, which, as Michael Han at Quora explains, means "confront (or ram on) to block". Instead, it should say 정지 or "Stop." Like a stop sign should! The movie even features Korean characters which...aren't even real Korean characters. Here, you can see the characters "모든｜." However, that isn't actually Korean (모든, though, is). Over on Quora, Han also points out that many of the actors playing North Korean characters sound stilted, awkward or simply off. One North Korean character even mispronounces her own name! I haven't had a chance to see The Interview. Perhaps the filmmakers focused more on the funny and less on the finer points of the Korean language?